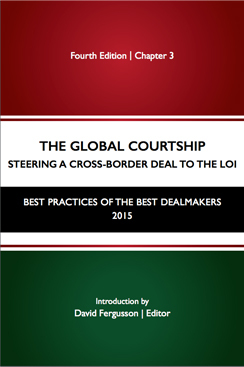 Recently I was selected as Buyout Beats “Need to Meet” for March and had the opportunity to share my outlook on early 2017’s M&A market and the factors affecting its activity. Read more from PE Hub Network here. 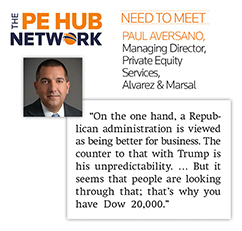 Paul Aversano, a managing director in private equity services at Alvarez & Marsal, had never seen a January quite so busy as this one. And corporate America, which has cut costs tremendously since the financial crisis, is laboring under conditions of anemic GDP increases. “U.S. companies have been struggling to grow organically,” Aversano says. “How do they deliver shareholder value? They’ve been stockpiling cash.” The answer is either stock buybacks or M&A activity. Buyers from China “seem to have limitless resources,” while “a whole new set of buyers in family offices and sovereign-wealth funds” would rather invest directly than pay fees to PE managers. “Adding fuel to all this fire is historically low interest rates, so when you lever up, it’s cheaper,” he says. Then, of course, there’s the President Donald Trump factor, with the new administration presiding over stock-market records. “On the one hand, a Republican administration is viewed as being better for business. The counter to that with Trump is his unpredictability. … But it seems that people are looking through that; that’s why you have Dow 20,000.” If Trump succeeds “you could see Dow 30,000”; if not, a trade war could erupt. “So you have this euphoria with the Trump administration, but in my opinion, some of that has yet to be proven,” he says. “It’s very interesting times,” Aversano said. “When you have this much volatility, depending on which side of the trade you’re on, you can be very successful. “The world of private equity investing has really changed,” he added. “Buy low, sell high” has been replaced with “buy high, hopefully sell higher.” Investors could previously make their money through financial engineering. “Now you actually have to do something to the asset, versus holding it and milking it for fees,” he says. Alvarez & Marsal has more than 1,000 operational professionals on staff, “real operators, people who have been CEOs or CFOs who have come into our business” to help clients create value through improving performance. “We like to collect executives; we collect them and we deploy them,” he says. 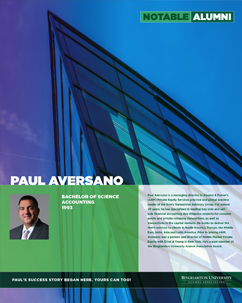 Correction: A previous version of this story incorrectly said Aversano has 11 years of M&A experience. 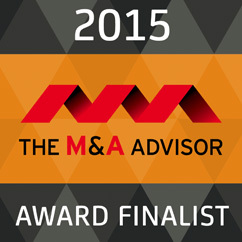 He has more than 20 years of M&A experience and has worked at A&M for 11 years. The report has been updated.